Those of you who have been reading my blog for a while know that I'm a rather passionate knitter. Some project is always on my needles and often it is actually more than just one. Kaefer is a willing "victim" for hand knitted sweaters, hats and tops. I have knitted a LOT of hats this past winter since some of them have been very popular in my Etsy shop. 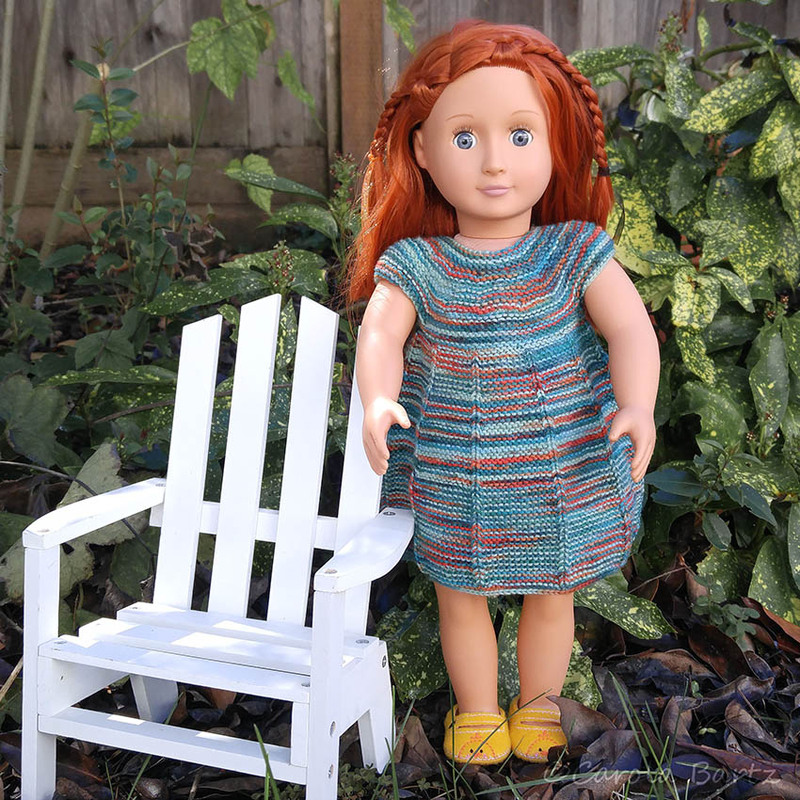 However, one of the things I love to knit - and not only because it knits up fast - is doll clothes, specifically knits for 18-inch dolls (like American Girl dolls). Swing tops are cute and just look good in any color. It's pretty much a non-brainer. The beautiful lacy cardigan, however, needs more attention. I don't think I have knitted one without making some kind of error and knitting "backwards" again to correct it. It's a bit of a tricky pattern and not something I can knit while watching a movie. The lace pattern goes all around and is pretty on the back as well. Every doll needs a tunic, I think, and even more so if it features a beautiful leave yoke. This tunic I started several times because I didn't "get" the pattern and then just simplified it. I'm quite happy with the outcome. Then, of course, there are dresses. How can you not have a dress for a doll? The yarn for this short sleeve dress is a sock yarn, and I actually knitted a pair of socks for me (which I love). But I had enough leftover yarn to knit up this very cute dress. The following combo is a dress with a tank top spruced up with a unique cardigan. I love the shape of the jacket - it gives the entire outfit a certain softness and makes the doll "dressed up". It's the leftover of some "tweedy" looking yarn that I used to knit a cardigan for a little girl. Gorgeous yarn! All of these doll clothes are available in my Etsy shop. I hope to knit up a few more - it is so much fun and the best way to use left over yarn. These dolls are more fashionable than I am, Carola! Well done! The doll knits are adorable! The cardigan is extra cute! These are such beautiful knits. You are a champion knitter. I never loved knitting. Still I remember that during my school years sometimes I had to knit.My sister used to knit a lot. but I love crochet. 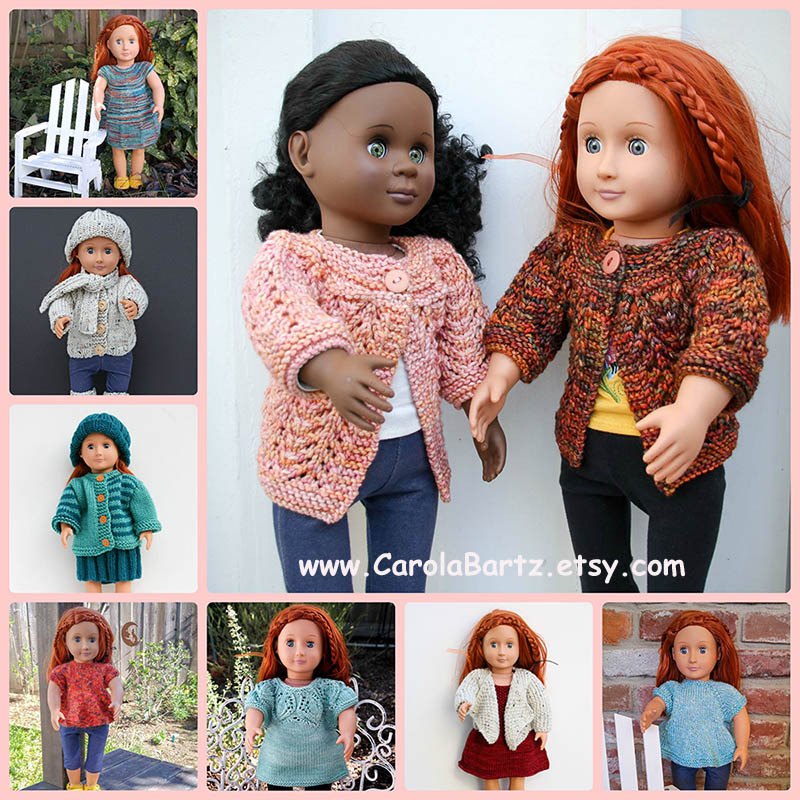 These doll sweaters are darling, Carola. What a special talent you have for knitting doll clothes. You know, I love dolls too, and these American Girl dolls were so popular when my girls were young. I think my favorite is the button sweater with the Autumn colors. My granddaughters would love these dolls. What a delightful post, Carola. Thanks for sharing. die Puppengarderobe ist ganz entzückend. Das ist ja teilweise das reinste Luxusdesign. You are so talented!!! I love all these creations! Beautiful! Big Hugs!